I was pretty excited when I saw the preview for the new collection from Little Yellow Bicycle! What I didn't realize until I got Splash in my hands is just how cool it really is, especially the new vellum tape strips!!!!! I didn't use them in my layout below because I am saving them for something later this month but I seriously love them! I did create a layout with some of the other bits from the collection. 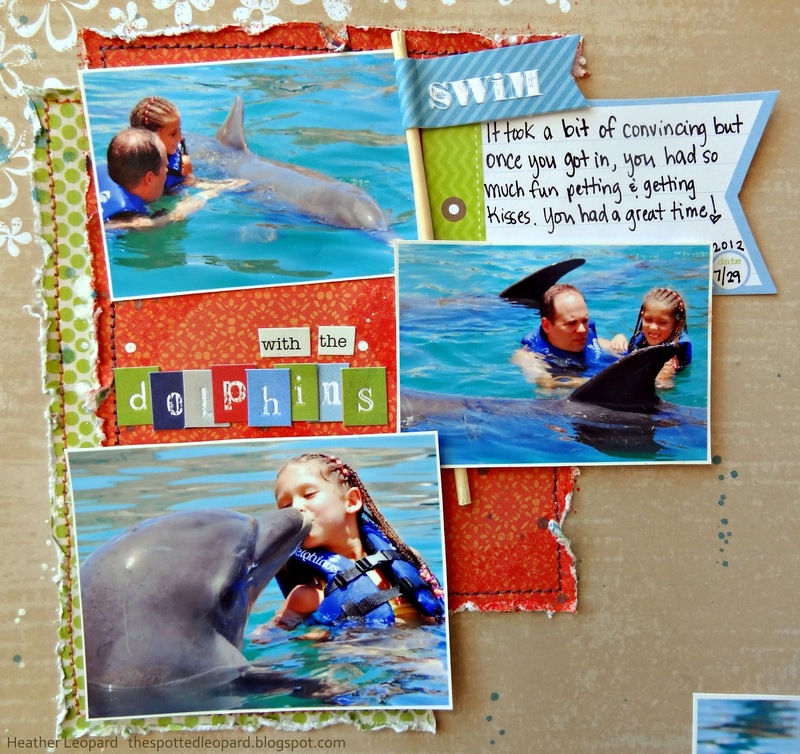 Last summer, we got to experience an adventure of a lifetime doing something as a family that I've always wanted to do – swim with the dolphins. It took some convincing to get my daughter in the dark water lagoon with mammals whose fins resemble a shark fin to my then 7 year old but once she saw that we were okay in the water, she got in and she had the best time! 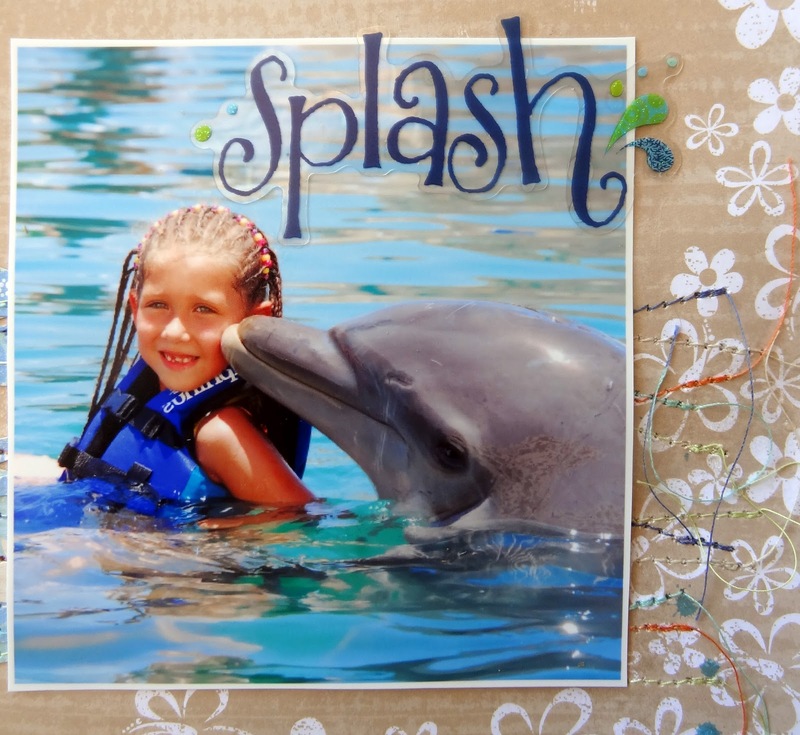 She's soo proud, she has a framed photo of her and the dolphin in her room. I knew that I wanted to mimic the waves in the water and the Makin’ Waves paper had a great water rhythm to it so I cut the waves from the paper and just layered them on top of each other until I got the look I was going for. I secured them with a dab of glue and then machine stitched over them in 5 coordinating colors. I kept the ends of the threads on purpose for 2 reasons – 1. I thought they added to the effect of the waves and 2. I didn’t feel right just abruptly ending the waves where they meet the photo but I also didn’t want to extend them across the entire page so I stitched on the right side of the photo to fade out the waves. I then highlighted the other photos and my title by distressing and stitching paper from the 6x6 pad (they’re not just for cards anymore!). Before I added my photos, I splattered blue and white mist over the papers to resemble water being splashed by the waves and dolphins. Thanks for stopping by today. Head over to the Little Yellow Bicycle blog to see what a few of the other Biker Chicks did with the Splash collection. Wow wow wow!! What an adventure that would be!! 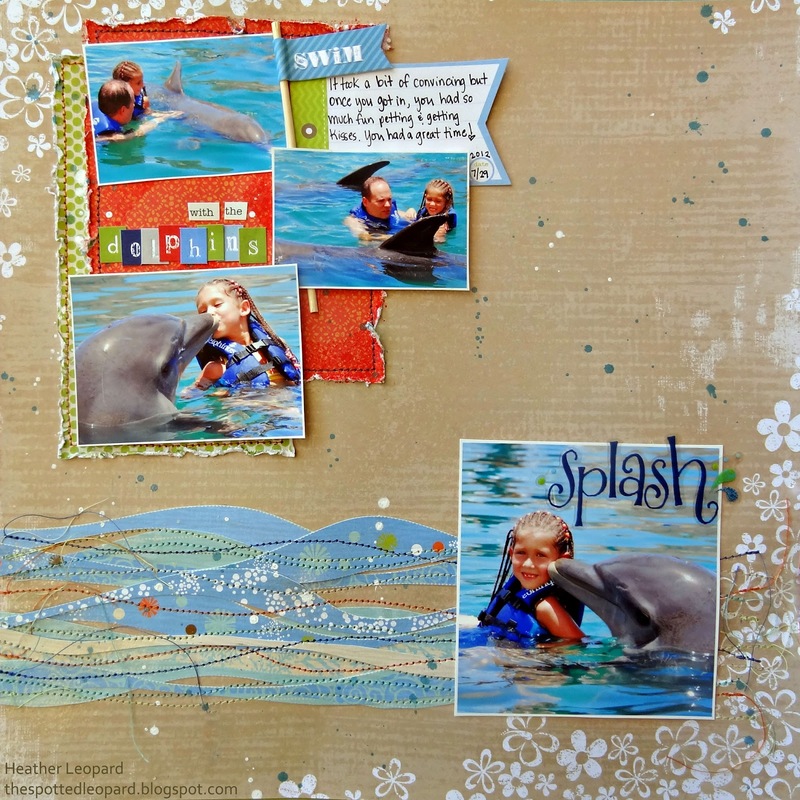 I loveeeeeeeeee the photos, the paint splatters and loveeeeeeeeee all the stitching!! GORGEOUS!!! Wow is right! Fantastic layout! LOVE all the stitching in different colors and those waves are just Ah-mazing! Great job! that water is AMAZING! GREAT layout Heather--those pictures are pretty amazing as well! besides these awesome photos my favorite part is the waves you created. very cool!! What a cool layout!!! I just enjoyed looking through your blog! So much inspiration!!! What a fun-looking layout. I love the design of it. LOVE this! I really love the stitching in the waves. Such a great detail! I love how you did the waves, and what great pictures! Love this! 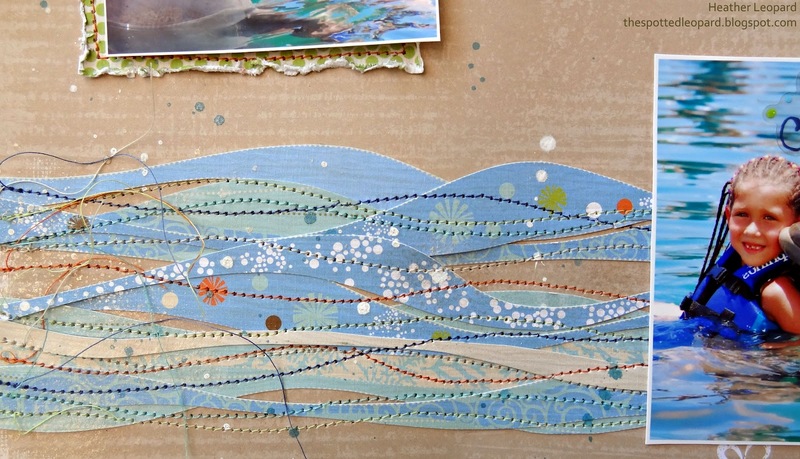 The waves and stitching are amazing! Such a fun page! Great stitching - such a fun layout! I loved this when I saw it at Little Yellow Bicycle earlier today. I am in love with the layout you used for everything. This is so so cool!!! I love your page, Heather! Yes, this was perfect for your photos! What an amazing experience for your family. I love dolphins too. We are going to Sea World in FL next week. No swimming with them, but did pay for the close encounter where we get to pet and feed them (just no getting in the tank). Wow girl!! 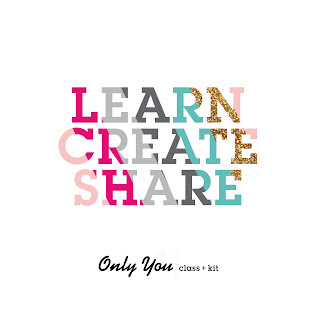 I came by to make sure you were on LYB DT before we passed out MS kits for July...since LYB was one of the choices. Anyhooo....love this layout...OMG...so many great ideas..so I was studying it very closely... and i noticed you put 2012 as the date? July 2012?? I do that all the time...LOL! How cute!! Love the way the pages are matching. And the wave stitching is great. Love all the fun stuff you added to showcase such a memorable event! I'm in awe of the colorful stitching, I'm usually too lazy to both rethreading for a page. 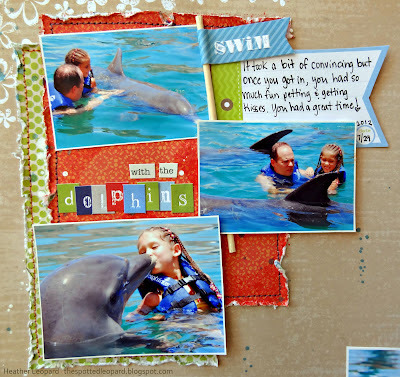 Thank you for sharing it on A Crafty Soriee, I've featured it in the newest one up on Thursday. That stitching is absolutely fabulous!! I thought I was addicted to it, but your addiction is much farther along than mine -- and I thank you for it! Beautiful layout! I think this is adorable! I especially like how you have created your waves - they are amazing! Love the wawes and the stiching, what an awsome detail!! what an amazing experience and your outstanding layout really highlights those fabulous photos! i love the stitched waves!